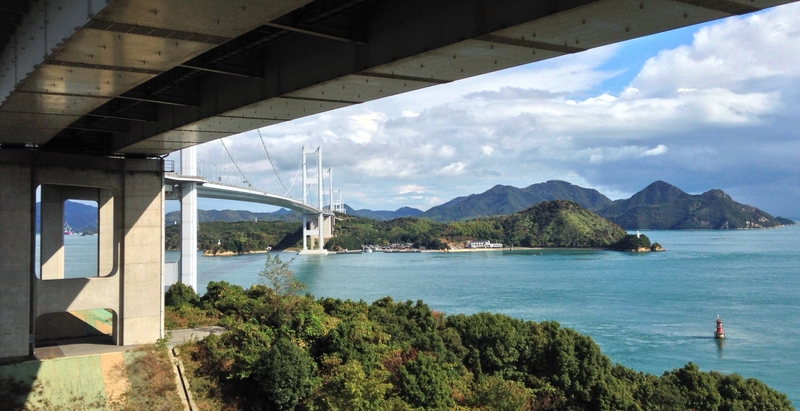 One of the best rides we did in Japan in November was the Shimanami Kaido, a route which connects Japan’s main island of Honshu, over 6 small islands in the Seto Inland Sea via a series of suspension bridges, before finishing on the island of Shikoku. 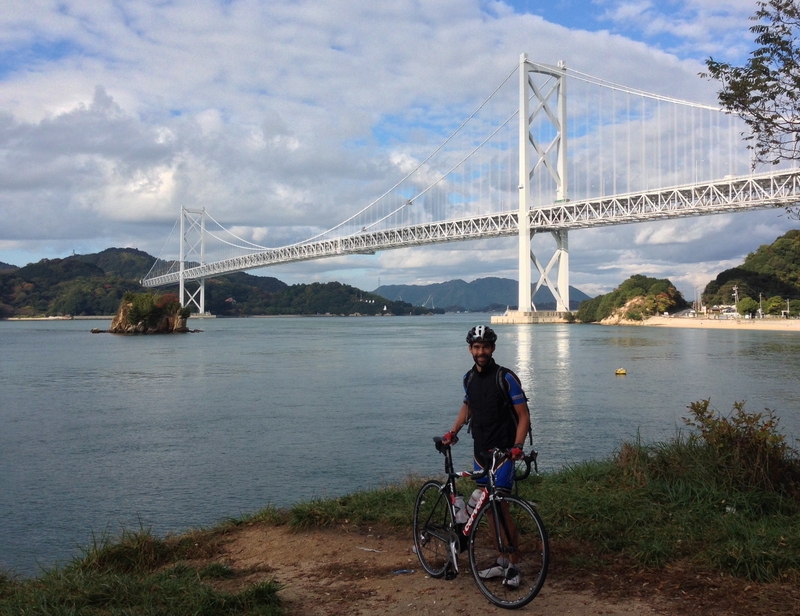 As our Japan trip was divided in two due to a week in Taiwan to do the Taiwan KOM race (see link here: Taiwan KOM 2015), we spent the first half of our Japan trip nearer to Tokyo “hill training” for the Taiwan KOM, leaving our journey south towards Hiroshima and then the Shimanami Kaido for the second half of the trip. 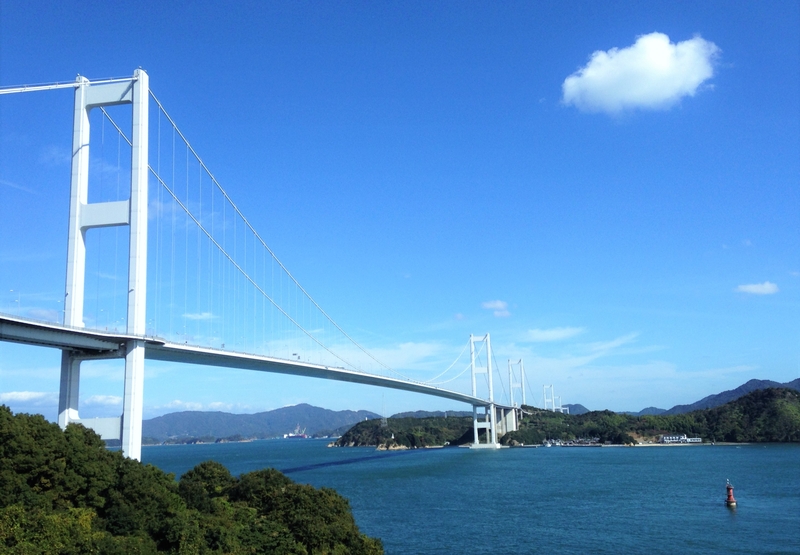 By the time we arrived back in Japan after the Taiwan KOM, we were starting to doubt our decision to do the Shimanami Kaido. We were worried that it would be flat and boring in comparison to the cycling that we had already done on the trip so far, particularly as the route was also suitable for “leisure cyclists” with the Lonely Planet reassuring its readers that it was possible to ride the 70km route in a whopping 8 hours. 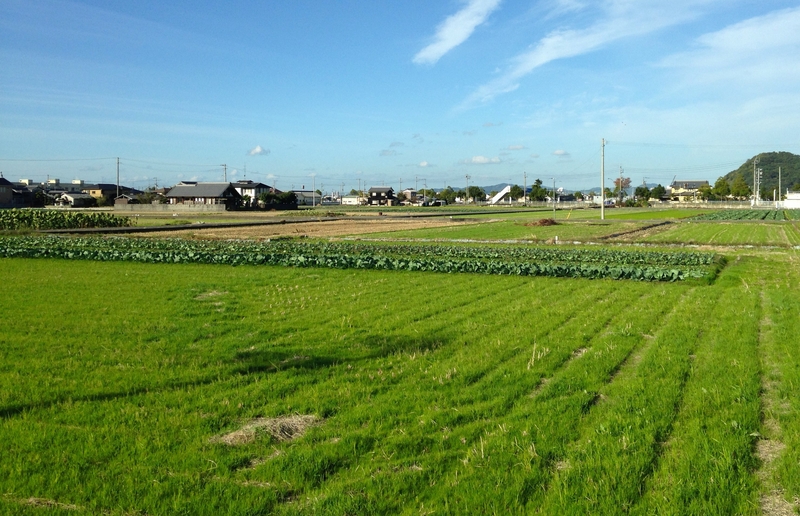 With accommodation and Shinkansen (bullet train) tickets already booked, it was too late to change our minds. 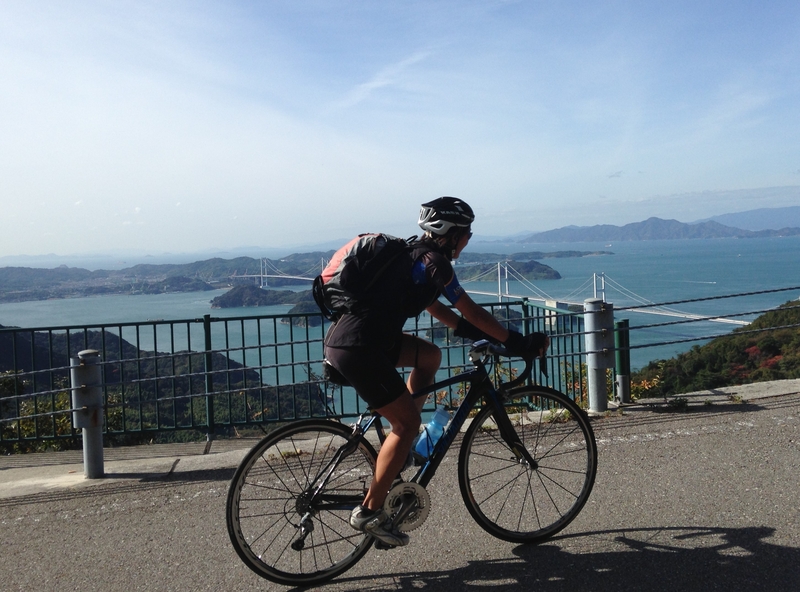 Therefore, to make the ride more interesting and challenging we decided to cycle the Shimanami Kaido to Imabari and continue another 50km or so to Matsuyama, before cycling back to Onomichi the following day. 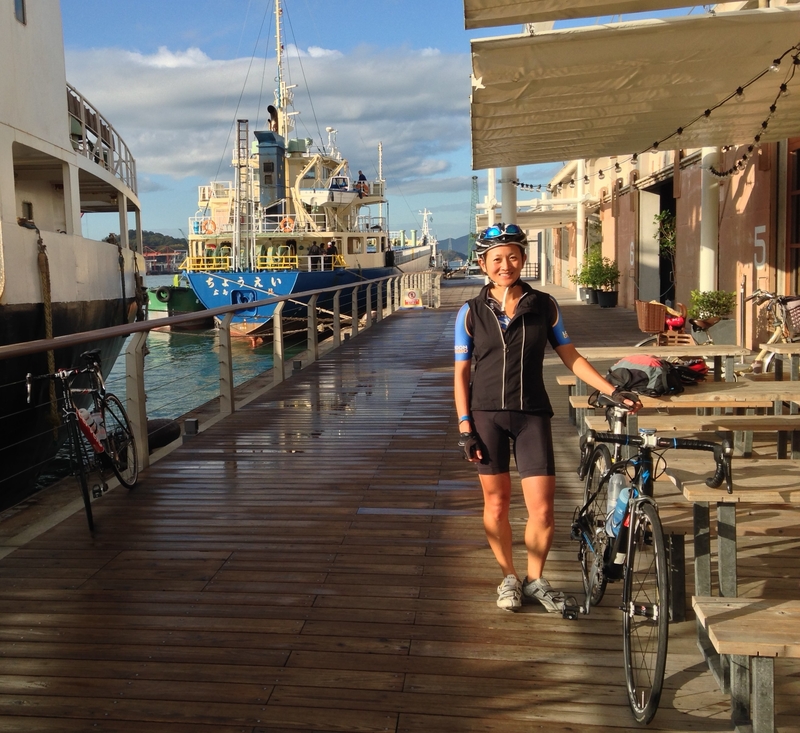 We arrived in Onomichi from Hiroshima on a wet day and checked into Hotel Cycle, which is situated in a newly redeveloped warehouse complex right next to the port, together with a Giant bike shop, lovely bakery and shops. Up until now we had been mainly staying in guesthouses and backpackers’ so it made for a nice change. According to the hotel’s website, you could cycle right into the lobby and check in whilst you still on your bike which we weren’t able to try out because our rucksacks were far too heavy for us to ride at the same time. 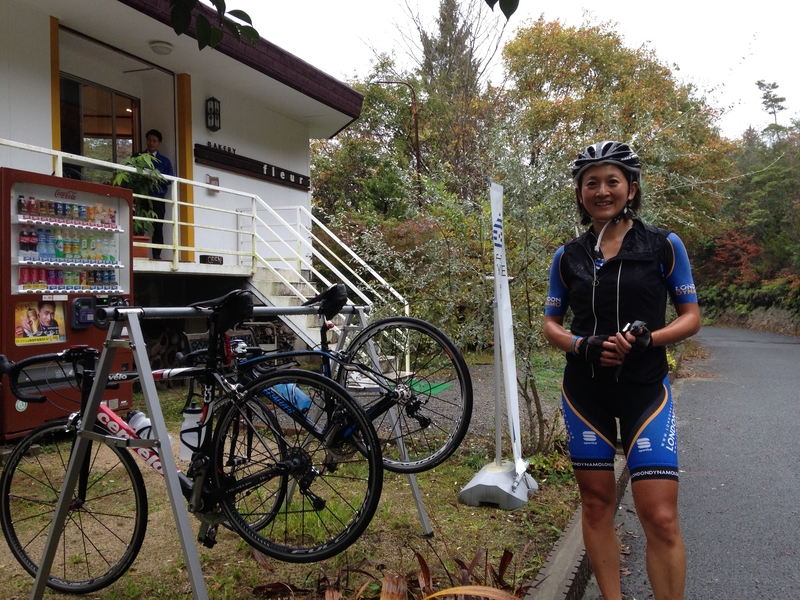 We went for a short ride in the rain to spin the legs out and happened to chance across the Fleur Bakery in the hills behind Onomichi seemingly in the middle of nowhere. Just one of those pleasant surprises that you often get in Japan. Luckily, we woke up to blue sky and brilliant sunshine the following morning and set off at around 8.15am. 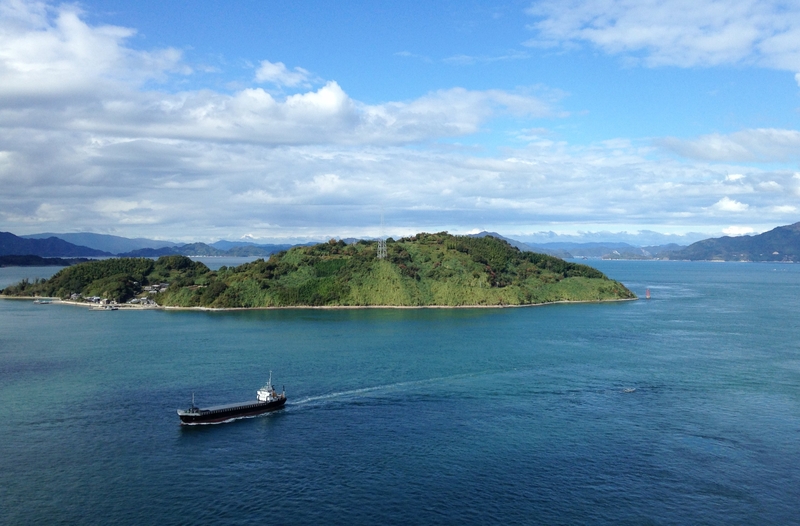 The first part of the Shimanami Kaido cycling route involves taking a ferry across the channel onto the next island – a 5 minute journey. From there, we just followed the blue line on the road. The route took us along quiet roads, through small villages and orange groves with very little traffic. The map guide and Lonely Planet warn cyclists about the “steep ramps” up to each suspension bridge – in reality each “ramp” was around 3% and 1-1.5km long. There was a honesty box on each bridge to pay the 100-200 yen toll (though for some reason, currently, cyclists and pedestrians are exempt). 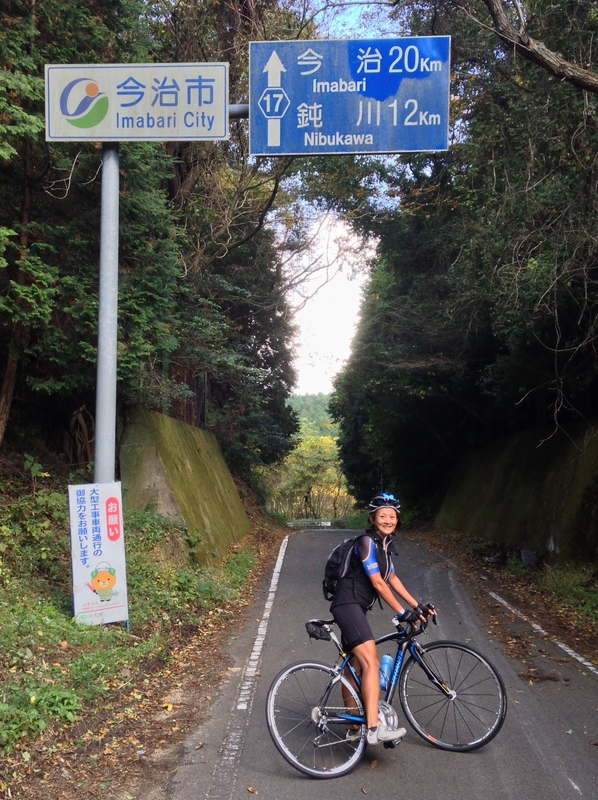 It took us around 4 hours to get to the end of the marked route in Imabari including numerous photo stops (riding time 3 hours). Imabari is another large port town, apparently the towel making capital of Japan, but apart from that, nothing particularly special. It was 10km along a busy road to get into the city centre where we had a picnic lunch of rice and sushi bought from a convenience store by Imabari Castle. 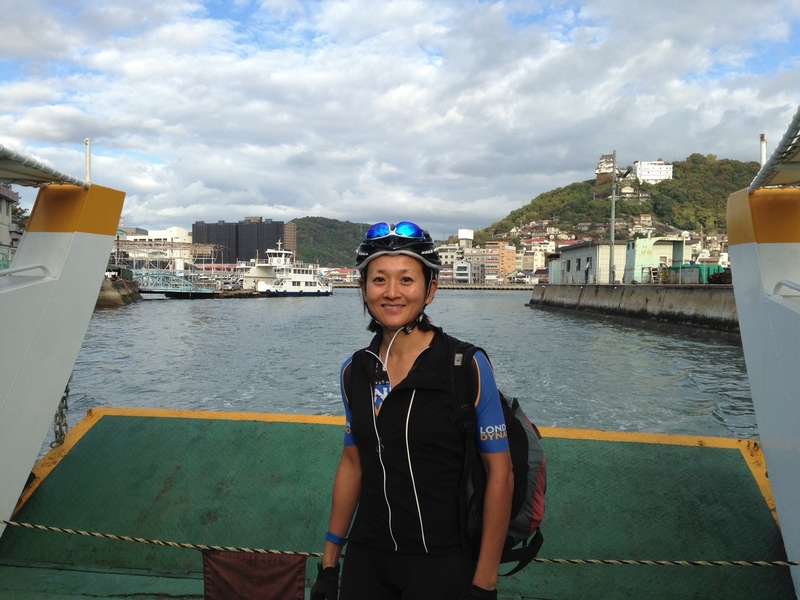 From Imabari onwards, sadly there were no more blue lines to follow and it was back to Googlemaps, following route 317 heading towards the hills and Matsuyama. We were unable to find any cycling specific information about what the 317 would be like but with hills en route, Mark decided that it must be a good road! 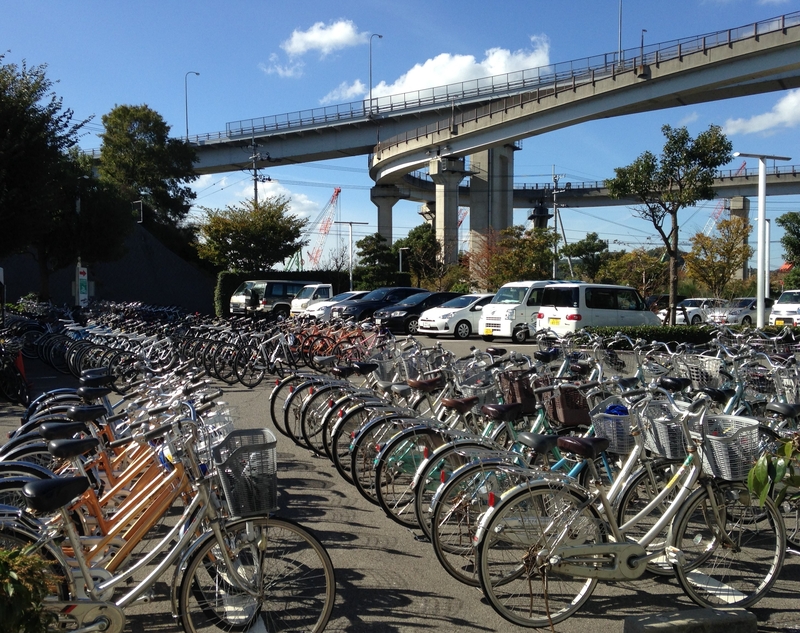 The alternative was to go along the coast road to Matsuyama, but this looked busy and windy. 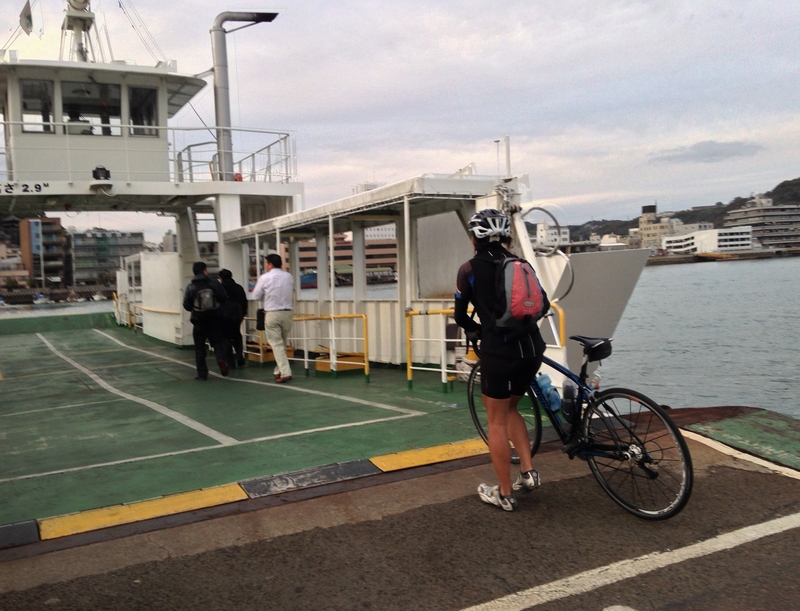 Coming out of Imabari city, the 317 was flat and busy. On the whole the Japanese drivers were patient, going round us but often pulling back in too quickly (underestimating the speed at which we were going and the length of their vehicle like many drivers back home). After about 10km or so, the road started to climb, still quite busy with traffic, but in a generally good condition with few potholes. The problem with using the local maps and/or Googlemaps was that without contours it was impossible to judge how steep a particular road would be nor did they show any other notable features… like the long tunnel that we unexpectedly came across (in hindsight, we should have noticed that the map showed the road suddenly going in a straight line instead of wriggling around). We had already had some scary dimly lit tunnel experiences elsewhere in Japan with traffic whizzing by far too close for comfort. I was very relieved to see that this tunnel had a raised pavement one side so at least we could cycle off the main road. And luckily we had lights. The 3km seemed to go on for a long time! 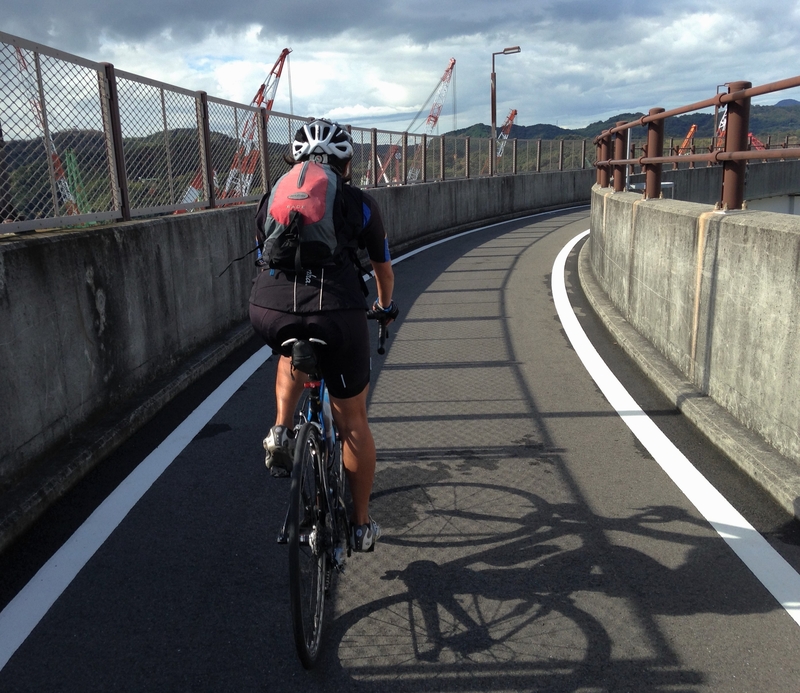 It is for this reason that I would not recommend this route to Matsuyama. 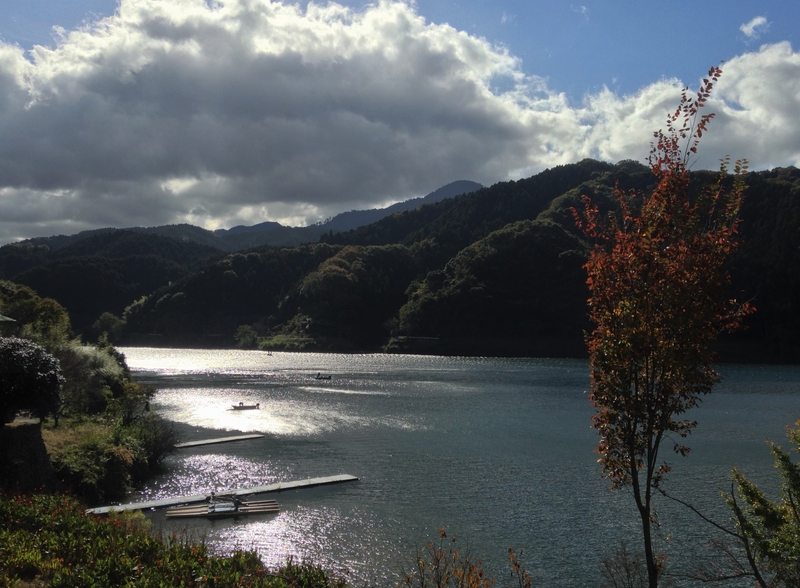 However, on the other side was a lovely descent and at around 10km from Matsuyama we passed this beautiful lake with the most amazing reflection of the sky I have ever seen. #nofilter! 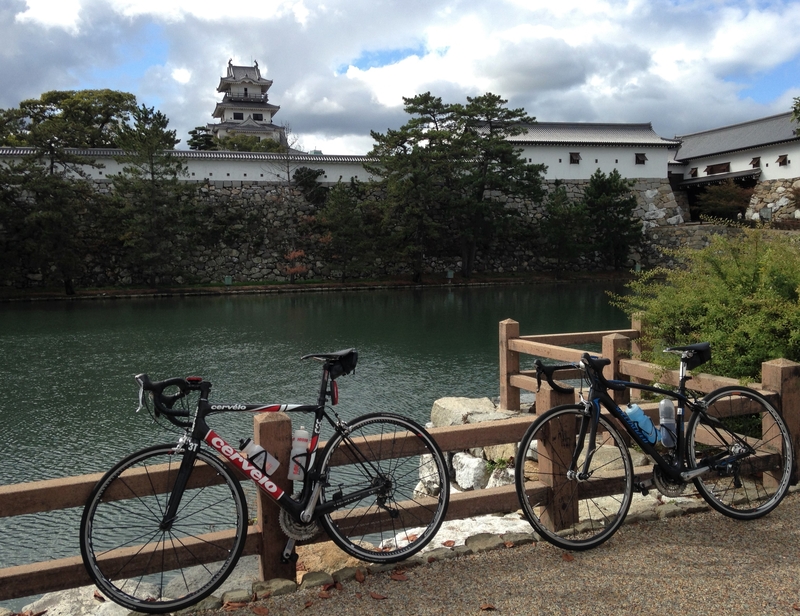 At around 3.30pm we arrived in Matsuyama after cycling a total of 120km. The main tourist attraction in the town is the Dogo Onsen, one of Japan’s oldest onsen (and apparently the inspiration for the bathhouse in the Japanese animated film “Spirited Away”). We spent the night in the Sen Guesthouse near to the Dogo Onsen and watched a spectacular sunset from the roof. The next morning was also bright and sunny. After a quick stop at a local bakery for breakfast we headed out of Matsuyama on route 20. Initially this was a steep climb in rush hour traffic but we were rewarded with a lovely sweeping descent down towards the coast. Headwind and heavy traffic along the coast road quickly resulted in a change of plans and we decided to take the 389 and then route 17 which headed back inland and towards the hills. Road 17 was fantastic – there was hardly any traffic, with an excellent road surface. It gently climbed into the hills before descending and re-joining the 317. We had a quick stop by Lake Tamagawa before continuing along the 317 back into Imabari. 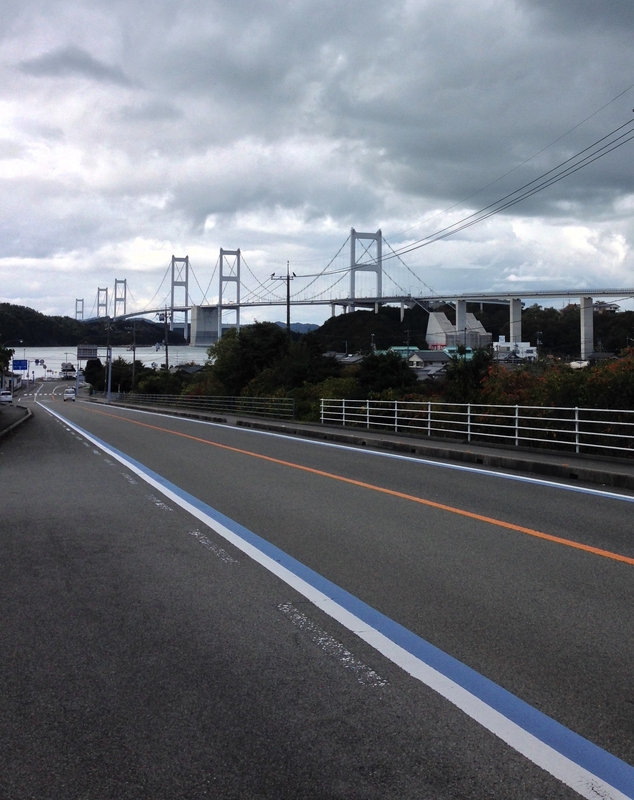 From Imabari we rejoined the Shimanami Kaido route again back to Onomichi. It was nice seeing the blue lines on the road again! There are actually many side trips you can do on each island that you cycle over. The only one we did was up the climb to the Kirosan Observatory Park on the island of Oshima which was just under 3.5km long with an average gradient of 9% – short but tough with incredible views at the top so worth doing. 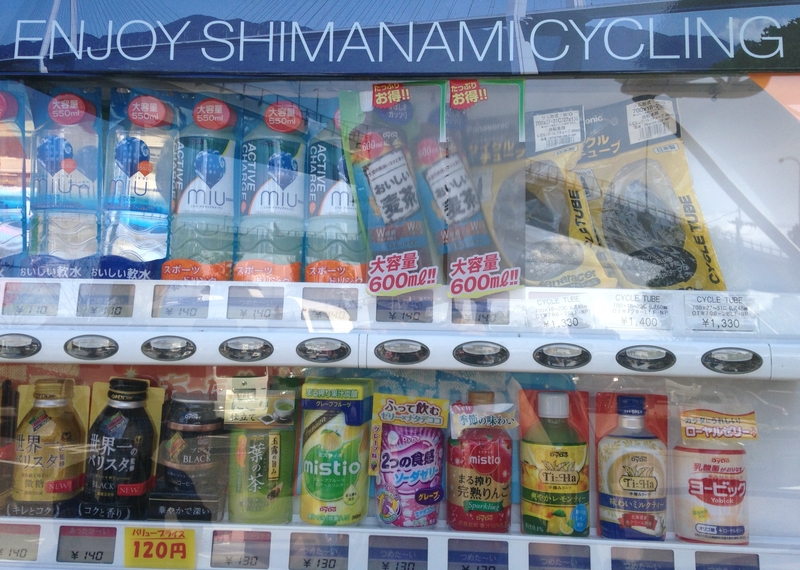 On the Shimanami Kaido route there are lots of convenience stores and conbinis (vending machines) to stock up on supplies, including one which sold inner tubes. However we did not see any on our routes between Imabari and Matsuyama so best to stock up before you leave either of these two towns. Total for the second day was 137km and 1,600m of climbing, with a lot of headwind on the way back. I was pretty pleased when we were back on the ferry again. Mark felt that we had burnt enough calories to be able to enjoy ‘Onomichi ramen’, a local noodle speciality with lumps of pork fat floating in the broth. 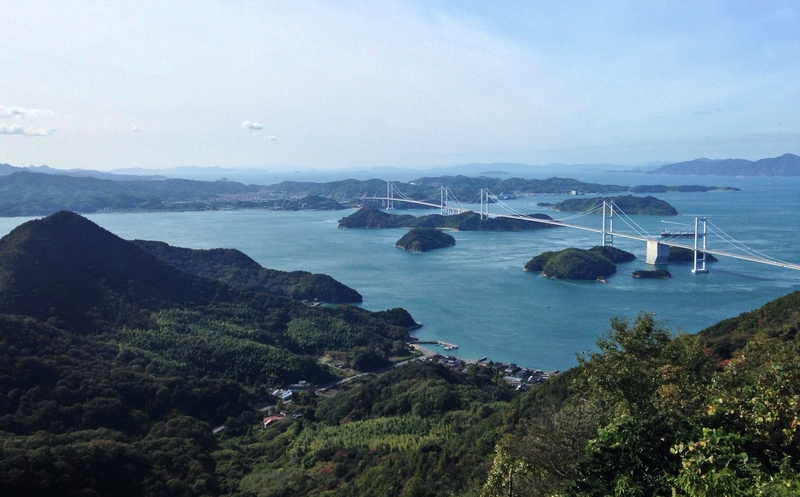 The Shimanami Kaido (with the Matsuyama extension) was an unexpected highlight of our 5 weeks in Japan. It made a lovely change from the hills that we had been doing up until this point in our trip, and it was actually quite nice to not have to constantly check the map and just follow the blue line on the road whilst enjoying the views. As we did this trip during the week, it was very quiet but having seen the large number of bikes for rent at the cycling terminals along the way, it probably gets very crowded at weekends and holidays (though a lot of people might only do a part of the route as there is the possibility of renting a bike, returning it at another cycling terminal and taking a bus back). 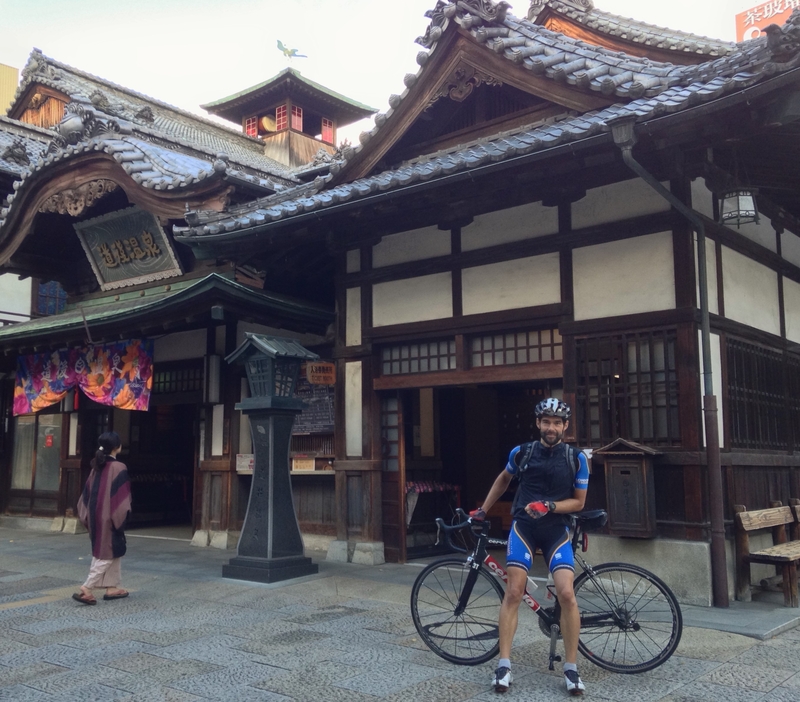 There is some general information on cycling in Japan as well as details of the other places that we went to here: Cycling in Japan.